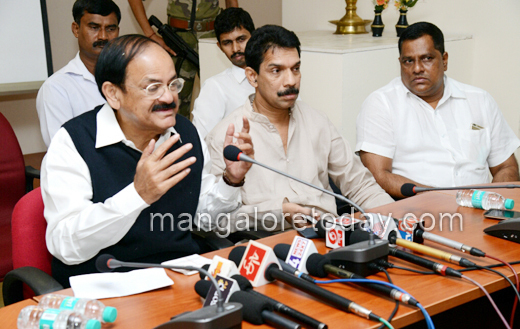 Mangaluru, Jan 20, 2016: Union Minister of Urban Development and parliamentary affairs, Venkaiah Naidu said that, Congress is politicizing the issue on Hyderabad student suicide case. “BJP Minister Dattatreya is not involved in any way” he said in a press meet held at International Airport Mangalore, today Jan 20 , 2016. 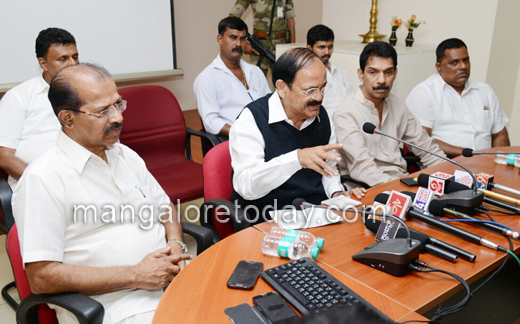 Dismissing opposition demand for resignation of his ministerial colleague Bandaru Dattatreya in Hyderabad incident, Venkaiah Naidu said there is nothing wrong in Dattatreya expressing concern over increased casteism and anti-national activities in the university campus. "Rahul Gandhi who did not find time to visit Hyderabad University where 9 students died in the past 11 years is now getting violent over death of Rohit Vemula," he said. He also said that, people has been appreciating Narendra Modi for the way he is leading the government. Congress and Left parties playing a role of delaying, divert and disrupt the parliament in order to defame the Prime Minister. Opposition parties cannot digest the determined work of Narendra Modi. They have objection in every issues and are propagating misinformation. Opposition Intension is to make Modi unsuccessful in his approach, obstruct the growth of the country, diverting attention of the people from development, and are playing vote bank politics, he added. He also said that long term reduction on tax, harassment and corruption to be addressed at the earliest. Country is facing revenue deficit, trade deficit, and will sort out the issues related to fiscal deficit and current account deficit. Economic growth in the country is been appreciated by World Bank and IMF when China is going down negatively in the economy sector. MP Nalin Kumar Kateel was also present. What is Naidu actually pointing on ?Is it the suicide of Hyderabad guy or praising their own party? Silence is virtue. Modi has done many remarkable and He is a efficient leader. But other are dragging him in unnecessary topics.